Ryerson Rams guard Jean-Victor Mukama hit a clutch three against the undefeated Carleton Ravens to lift the men’s basketball team to a thrilling 78-74 win at the Ravens’ Nest on Jan. 26. Down by two, with less than a minute left to play, the ball was in Mukama’s hands and he made sure to deliver. Connecting from long distance with about 33 seconds remaining, the fifth-year guard put the Rams in the driver’s seat to take down the No. 1 nationally ranked Ravens. 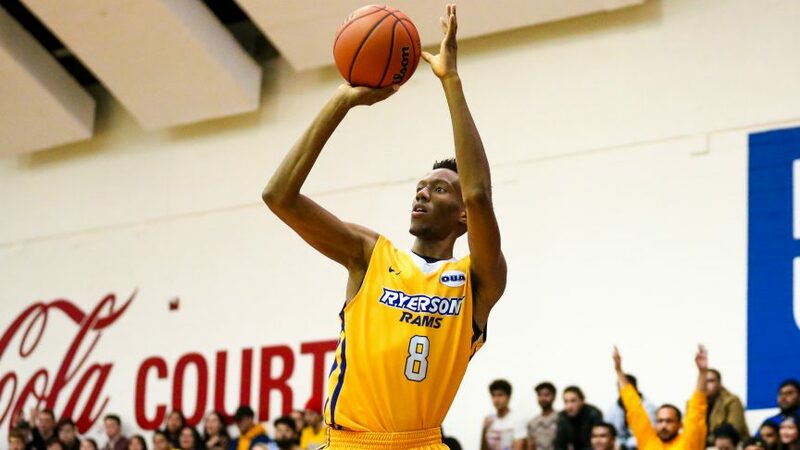 Stellar defence on the next few possessions, and a pair of clutch free throws from guard Yusuf Ali would put the nail in the coffin, as Ryerson handed Carleton their first regular season loss since Feb. 5 of 2016. Mukama poured in a game-high 25 points, five rebounds, and three assists while his backcourt mate Myles Charvis added in 21 points, six rebounds, and five assists. The win gives Ryerson their seventh consecutive win and improves their record to 17-1 on the season. It was a back and forth contest that saw two of the top teams in the country trade baskets for most of the night. The Rams managed to take control early in the third quarter, as they went on a 13-2 run to begin the second half. When it looked like the Ravens were dead and left to dry, they responded with a run of their own, managing to take a five-point lead with four minutes remaining after trailing by as many as 15. Once again, it was the veterans on the Rams roster that rose to the occasion and they wouldn’t let the Ravens spoil their night, locking in defensively late help grab the win. After not scoring a single point in the first two quarters, Yusuf Ali was a different player in the second half, dropping 12 points on 3-4 shooting and making 5-6 of his shots from the free throw line. The Rams sophomore centre Tanor Ngom was huge in protecting the paint, recording six blocks to go along with eight points and eight rebounds in 25 minutes of action. Ngom was in foul trouble for large portions of this game and fouled out with over one minute left to play. With Tanor in and out of the game, the Ravens took advantage of that and fed the ball to forward Eddie Ekiyor, who carved a name for himself in the paint. Ekiyor finished with 21 points and 10 rebounds on 9-12 shooting in 35 minutes off the bench. This is the first loss at home for the Ravens since the OUA championship game against Ryerson in the 2016-2017 season. UP NEXT: The Rams will head back to Toronto to take on the Toronto Varsity Blues at the Goldring Centre on Feb. 1. Tip-off is scheduled for 8 p.m.